Melbourne was where Mobile Tyre Shop was founded in 2012, and where we trialled our business model before going national. Our National Support Centre is located in Clayton serving the many bright yellow and white vans we now have around Australia. 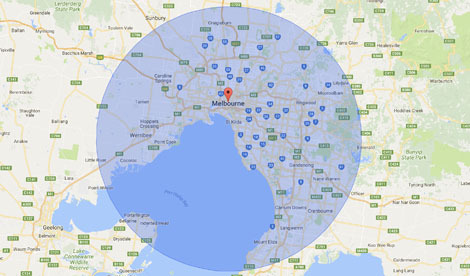 In Melbourne, our Tyre Technicians operate in the CBD of inner Melbourne, the Western Suburbs down to Geelong, Northern Suburbs out past Craigieburn, Eastern Suburbs past the Dandenongs and Yarra Valley, South Eastern Suburbs, Bayside Suburbs and Mornington Peninsula as far South as Sorrento and Portsea. With all this coverage you can be sure that we are never far from bringing you your new tyres to change and balance on your car. To get started with new tyres, give us a call on 1300 687 000 and one of our friendly Tyre Specialists can advise you on the best tyre for your vehicle, your driving style and your budget. They’re happy to help with any questions you might have about tyres. Once we’ve confirmed and quoted your preference, they will arrange for a Tyre Technician to come to you at the most convenient time for you at work or home and replace your tyres. It is simply the most convenient way to have your tyres changed. Melbourne CBD, Western Suburbs, Northern Suburbs, Eastern Suburbs, The Dandenongs, Yarra Valley, South Eastern Suburbs, Bayside, Mornington Peninsula.